Joomla Tip/Tutorial: How to use the free Google Analytics service for my Joomla Website? Free and easy to use for everyone. Offers advanced information about the traffic of your Website. Possibility of user-defined custom reports. Integrated with the Google advertising service AdWords. Tracking of all your online campaigns. Safe. All information is protected from non-authorized people. Integrity and protection of all data. It is part of a larger Google product suite. It offers support and professional services. 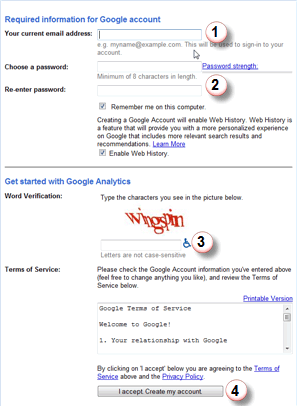 The first thing you should do before you can use the Google Analytics service, is to create an account at Google. Therefore go to the Web page of Google Analytics. On the right side of the page click on "Sign Up Now". Then you can see the Web page for a new account creation. Here enter a valid email address. Here enter a password for your account (2 times for verification). Here enter the characters you see above in the "Captcha" picture. 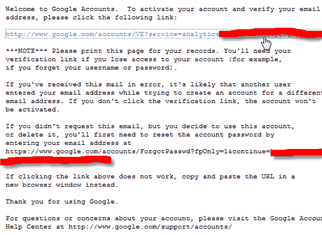 After you complete the above procedure you will receive an email with information about the activation of your Google account. This email will contain a link on which you have to click, in order to activate your account. After clicking the activation link, a browser window will open and you will be notified about the Google account activation.